Wesley’s work onstage and in TV commercials soon caught the attention of Joe Roth who cast him as an Olympic boxing hopeful in Streets of Gold. He was then handpicked by Martin Scorsese and Quincy Jones to play the gang leader in Michael Jackson’s Bad music video. And he subsequently joined the cast of Wildcats (1986) as well as Spike Lee’s Mo’ Better Blues (1990) and Jungle Fever (1991). The unique diversity of Wesley’s charisma, acting ability, and proficiency in the martial arts led to roles alongside some of showbiz’s biggest names – Robert De Niro, Sean Connery, Dennis Hopper and Sylvester Stallone. These roles include Major League (1989), Passenger 57 (1992), Rising Sun (1993), Boiling Point (1993), Demolition Man (1993), Drop Zone (1994), The Fan (1996), Future Sport (1998), and Undisputed (2002), all of which made him a most favored African-American action star not only in Hollywood, but internationally, as well. 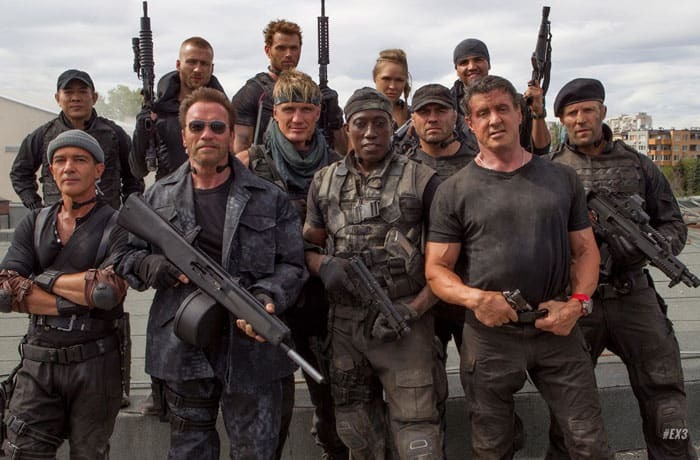 Below the photo, Wesley talks about his latest outing as Doc alongside Sly Stallone, Arnold Schwarzenegger, Harrison Ford, Mel Gibson, Antonio Banderas, Terry Crews and Kelsey Grammer in The Expendables 3.